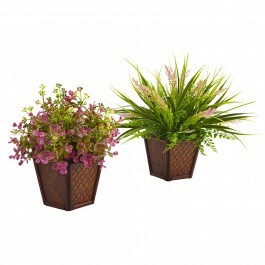 Dainty green and purple leaves contrast well with dark and light green spiky leaves in these two planters. This set of two is perfect for mixing and matching. Can be used together to create contrast or separately for a statement piece. Both come in a brown, decorative planter. H: 4 In. W: 4 In. D: 4 In.